Stuffed Pepper Soup - ready in 30 minutes! 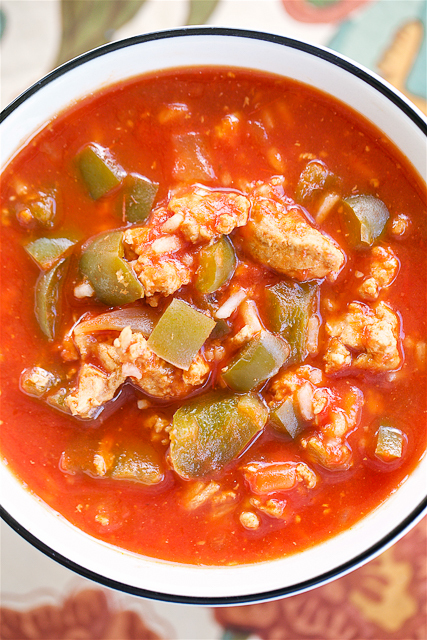 Ground turkey, green peppers, onion, garlic, tomato soup, beef broth, crushed tomatoes and brown rice. SO good!! Great for a crowd!! We love soup, especially when the weather has cooled off. 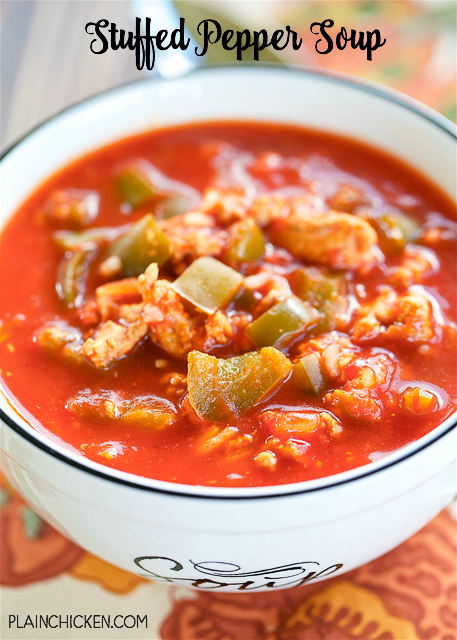 This Stuffed Pepper Soup is great for chilly nights! It is so easy and tastes great. To save on some calories (the holidays are coming! ), I used ground turkey in this recipe. If you aren't a ground turkey fan, feel free to substitute lean ground beef. Either way this will taste great!! This soup only has a few ingredients and is ready in under 30 minutes. You could even throw it in the slow cooker and let it cook all day for a super easy dinner. We loved this soup. As we do with most soups, we ate this for dinner and reheated for lunch. It was great both times! This is definitely going into the soup rotation. In a Dutch oven over medium heat, cook ground turkey with chopped peppers and onions. Drain fat. Add garlic and cook for 30 to 60 seconds. Stir in tomato soup, beef broth and crushed tomatoes. Bring to a boil. Reduce heat to low. Cover and simmer for 20 minutes. Stir in cooked rice and serve.